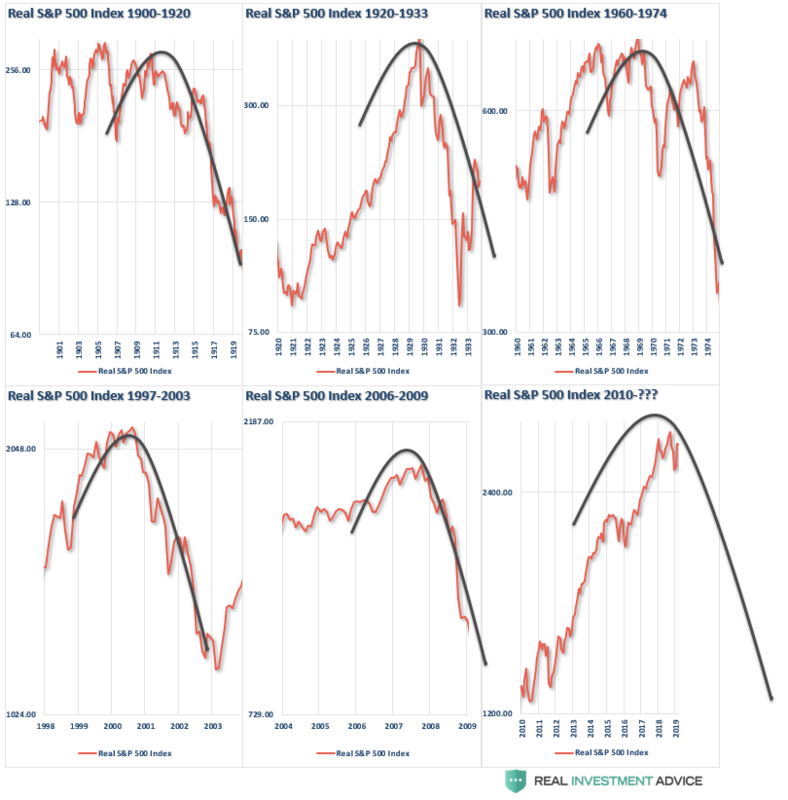 Market Cycles Signal Imminent "Collision Between Reality & Widespread Fantasy"
“It isn’t just the economy that is reminiscent of the 2007 landscape. As noted above, the markets also reflect the same. 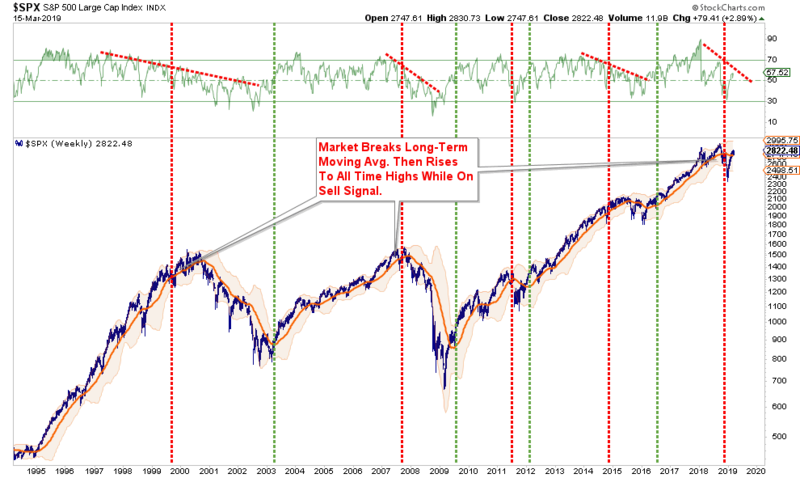 Here are a couple of charts worth reminding you of. The markets, confounding many, have vaulted higher from the Christmas Eve lows with nary a selloff. Market structure (and the dominance of price following products and strategies like ETFs, CTAs and Risk Parity and Volatility Trending/Targeting) exacerbated the trend lower into late-December. The breadth thrust and reversal in price momentum contributed to the post-Christmas rally. As I have previously noted, in an investment world dominated by the aforementioned products that worship at the altar of price momentum – ‘buyers live higher and sellers live lower.’ This phenomenon has exaggerated market moves and has created an air of artificiality and absence of price discovery (on both the upside and the downside). Corporate buybacks – abetted by tax reform introduced 15 months ago – provided another reason for a strong backdrop for higher stock prices. As a result of the above factors (and others) animal spirits rose and valuations expanded. He is correct, the “animal spirits,” which were awakened by consecutive rounds of financial stimulus on a global scale, has enticed investors into the belief that all risks of a market cycle completion have been removed. The problem, as I have discussed previously, is this optimism comes at a point in history diametrically opposed to when President Reagan instituted many of the same conservative policies. 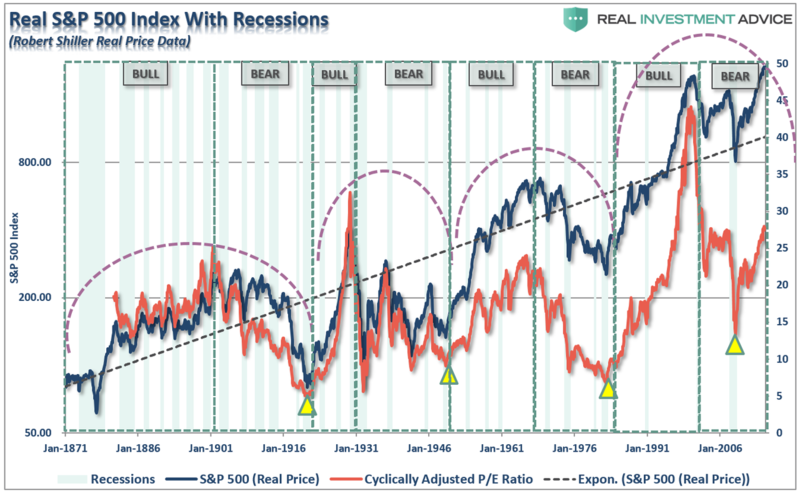 By looking at each full-cycle period as two parts, bull and bear, I missed the importance of the “psychology” driven by the entirety of the cycle. In other words, what if instead of there being 8-cycles, we look at them as only three? The third (current) full-market cycle is only 39-years in the making. 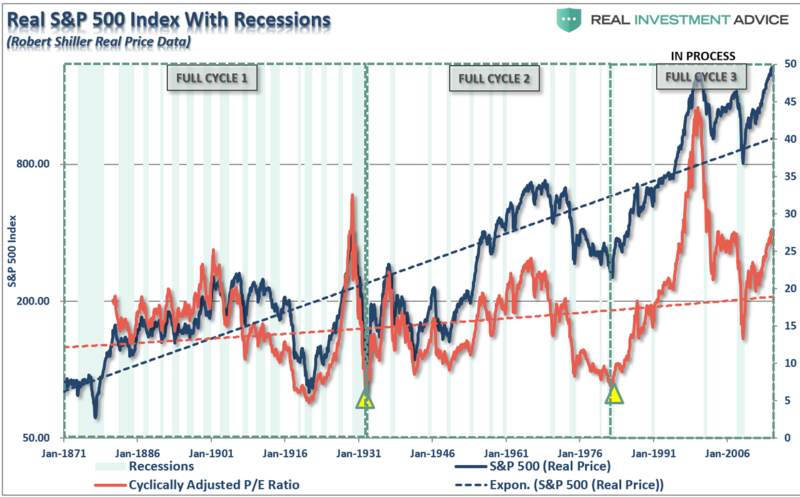 Given the 2nd highest valuation levels in history, corporate, consumer and margin debt near historical highs, and average economic growth rates running at historical lows, it is worth questioning whether the current full-market cycle has been completed or not? 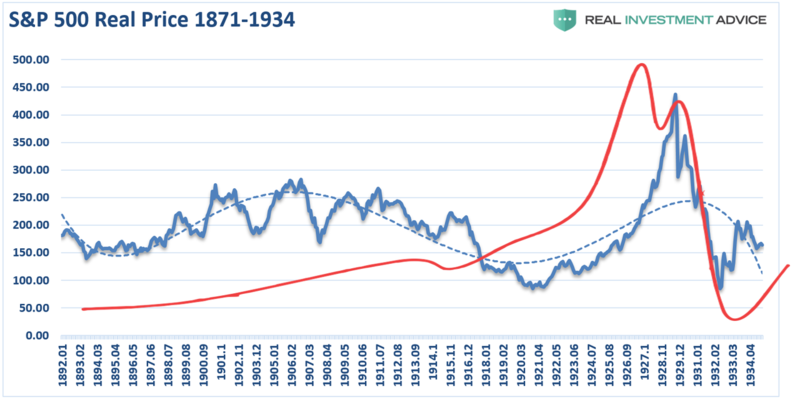 The idea the “bull market” which begin in 1980 is still intact is not a new one. 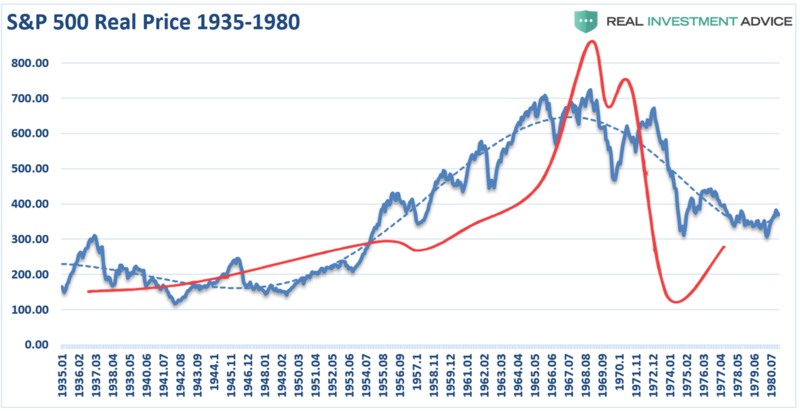 As shown below, a chart of the market from 1980 to the present, suggests the same. 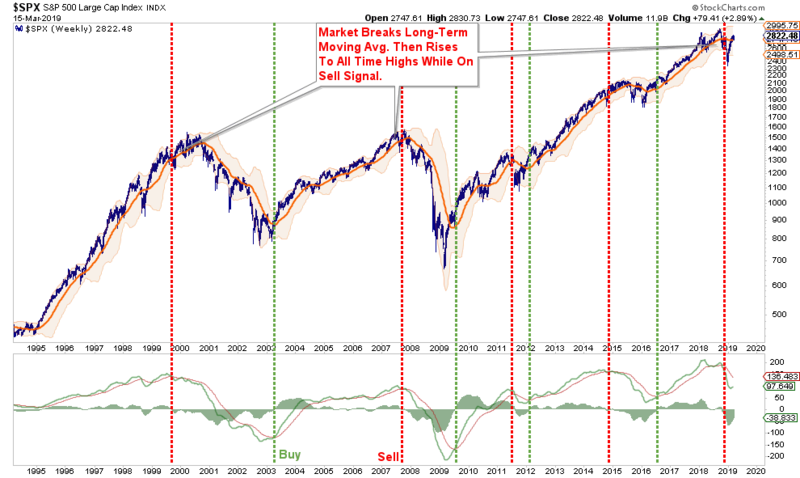 The cycle-oscillator is only half-way through a long-term cycle. On a Fibonacci-retracement basis, a 61.8% retracement would almost intersect with the long-term bullish trend-line around 1200 suggesting the next downturn could indeed be a nasty one. 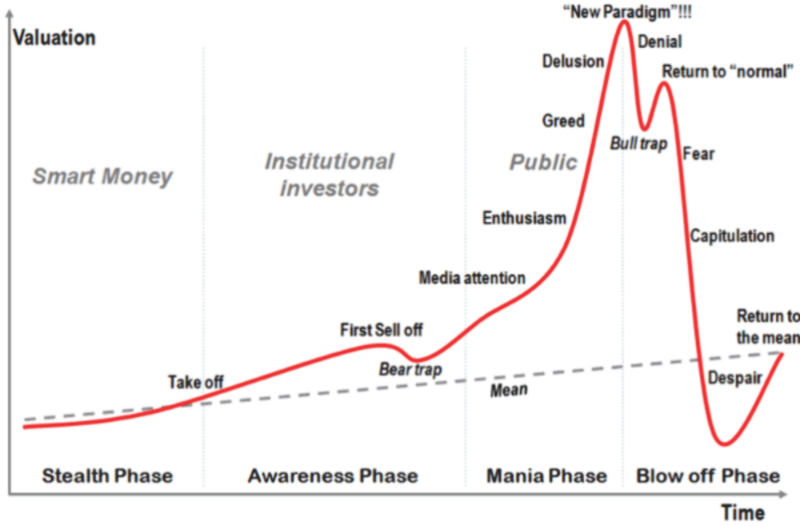 A second supporting theory of full market cycles was George Soros’ take on bubbles. Eventually, a tipping point is reached when the trend is reversed; it then becomes self-reinforcing in the opposite direction. It is critically important to remain as theoretically sound as possible as a large majority of investors have built their portfolios on a foundation of false ideologies. The problem is when reality collides with widespread fantasy. Personal Request: I need your assistance with a new project. We have recently launched a beta version of our new Financial Health App backed by the power and security of Yodlee, AWS, ForgeRock, and Intrinio. Our goal is to develop the next generation financial application to help you get control of, and grow, your wealth. Once you try it out, give us feedback as we continue to develop many new features over the next few months.